The Volvo V70 CNG BiFuel has officially been declared the cleanest production car in the UK. And that is good news for customers, because they are now entitled to a whopping 75 per cent grant towards the cash differential between the BiFuel and its petrol-powered Volvo V70 cousin. The cleanest production car accolade, jointly shared with the Vauxhall Vectra LPG Dual Fuel, comes from Powershift, a government funded initiative launched by the Energy Savings Trust in 1996. Powershift's aim is to kick-start a sustainable market for alternatively fuelled transport in Britain. As part of the scheme, Powershift funds a proportion of the differential between an alternative fuel vehicle and its petrol equivalent, or the conversion cost as appropriate. These grants are calculated on emissions performance against the current EU standard. With emissions of the Volvo V70 BiFuel now around 89 per cent below this standard, it qualifies for the maximum 75 per cent grant. It means that the £1,700 differential between the BiFuel and a petrol V70 will be funded to the tune of £1,275 by Powershift and just £425 by the customer. "This is a notable achievement for the Volvo V70 CNG BiFuel," explains John Pitts, VCUK's environmental manager. "It doesn't take into account carbon monoxide emissions, where the CNG BiFuel performs even better than its LPG rivals. And our three-year warranty makes the Volvo V70 the most attractive clean option, with the added benefit of it costing just 43p per litre to run. "It is also confirmation that big cars don't have to be dirty cars." To obtain the Powershift grant funding, customers only have to fill out a simple two-page form. This can be ordered as part of a pack if they contact the Energy Savings Trust Hotline on 0345-277200, quoting the name Powershift. Dealers are advised to get hold of a pack themselves, then order extra copies ready to pass on to customers who express an interest. Production of the Volvo S80 five-cylinder engines - the 2.4-litre 140bhp and 170bhp, as well as the diesel variant began this month. This means that the full engine line-up (bi-fuel apart), will be completed by the end of 1998. Initially, both the 2.4 140 bhp and the 2.5 diesel will be available in manual only: the former until late spring 1999, the latter until March 1999. The 2.4 170 bhp is available immediately in manual and auto and Volvo already knows it is on to a winner, with an Autocar review of the 2.4 170 bhp in Sweden last June having given it a glowing report. Volvo S80 continues to feature well in the motoring press performing creditably in tests against key competitors, including Mercedes, Alfa Romeo and BMW It was also featured on the Motor Show 'Top Gear' programme and Quentin Willson agreed that it was quiet, comfortable, well specified and quick. Volvo S80 was also shortlisted for the 1999 European Car of the Year Award and came a very creditable fifth. Production start of the five-cylinders also heralds a number of changes. Stability and Traction Control (STC) is now standard across all Volvo S80 variants. 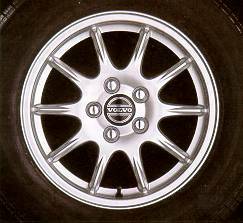 Two new alloys are introduced: a 15" wheel, Argon, available for five-cylinder cars, and 16" Regulus, available on all except for T6 SE. Finally, a new colour is introduced, Polarctic Blue. The first ever Volvo Approved Used Car Programme campaign mounted this autumn, which included national advertising and tantalising offers on servicing and warranty, has proved a significant success. From October 22 to November 22 1998, customers buying a used Volvo S40/V40 or a Volvo S70/V70 that was less than two years old from an authorised Approved Used Car Dealer could take advantage of either three years' free warranty or three years' free servicing, subject to certain conditions. As a result, the total number of enquiries during the period rose to 4,244, that's 11 per cent up on October in what is generally acknowledged to be a quieter period. The total number of used car sales was 1,343. Of this latter figure, 87 per cent of customers plumped for the service offer, with 13 per cent preferring to take the free warranty. "This is certainly good news, particularly as only 83 per cent of dealers have reported their figures," says Jim Gallagher, product manager - Used Car Marketing at VCUK. "Considering it is the first time we have embarked on such a campaign, feedback suggests that our activities were well received by customers. And the result is that we have bucked the downward trend of October," reports Jim. "The other significant thing to emerge is that the dealers who participated in local advertising, rather than relying on our centrally organised national and regional efforts, are the ones to have benefited most." The Volvo Approved Used Car Programme has been endorsed this year by What Car? as the best programme of its kind in the industry Any Volvo purchased under the scheme will have been fully inspected, authenticated and reconditioned to Volvo standards, with independent monitoring from the RAC.